Ant traps are the paths of death for the ants. And, it’s quite common to think, the trap isn’t safe for anyone or anything. 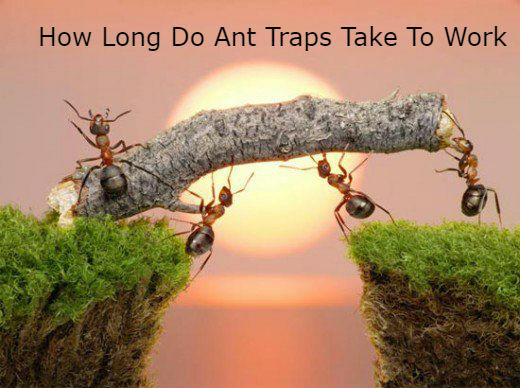 Do you know how long ant traps take to work? Well, this is my topic of this article right now. This is not actually “trap” as we call. This is the bait for ants. Ants are part of nature. But when it comes to home, it becomes irritating. When ants like fire ants bite, the pain becomes intolerable. The stingy bites are more terrifying among the little kids. There are more types of irritating ants available those build colonies in human territories. Several household ants such as carpenter, pavement etc. ants are not so harmful. Ants stay in the colony as like the human. They require food for feeding. A queen ant lays eggs and the worker ants work for searching foods to feed everyone including the queen. The whole colony remains protective by these ants. When they feel any threat, they try to protect by attacking the threat. Laying eggs and to live on, ants require to go on a search for foods. The worker ants collect the food and bring them to other ants. This is what you need to know before asking how long do ant traps take to work. Ant baits or traps take really enough time. So, we get confused if the bait is working or not. Worker ants spread the poisonous bait to their colony. When the queen ant takes the bait as food, everyone dies. Thus, the entire colony gets demolished. So, you need to make sure you are putting things in the right place. When we see baits aren’t showing any result, we go for the ant killers; spray, powder etc. But it’s not fruitful as ant traps. Because ant killers can’t kill all of them. There are multiple reasons why ant traps are taking time to kill the ants. If you see no result, probably you are setting the trap to incorrect place. Check if there is any trail of ants. Then set the trap. Putting it anywhere can be a matter of despair. Ants trail can be found mostly near sink, tap, any crack on the wall etc. Set the bait nearby these things. The other reason can be the type of food they are getting is enough for the ants from your places. So, they aren’t coming even near to the traps. The bait or trap is acting here as a weaker competitor to those foods. There can be more reasons why the traps are working slower. When we see traps are not working, we use alternatives. For an example, if we spray, then the ants will be invisible for a couple of days. Then again, they will come. Spraying or using other ant killers with baits can’t be effective. Moreover, you should wait till the bait is completely finished. So, if you can keep these things in your mind, then you will find the ant traps or ant baits positive. Just wait and see if the traps are working.